Joey's pub is located few steps into a lane close to Big Bazar shopping complex and opposite to the post office of Laden La road. From outside, this one storeyed building looks like an English country home with a small front porch having a triangular roof. There is a small iron gate outside and then you reach the main door. 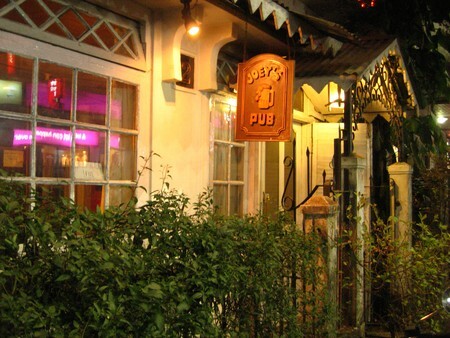 An wooden board hangs outside from the beam with a bold signage of "Joey's Pub". The pub is run by Puran Gongba. This building was originally built in 1948 by his father who ran a small hotel and a restaurant here for the backpackers. Puran was deeply immersed into music in his early days and had his own band. He used to be and is still a great guitarist. However, he could not continue with his passion beyond a point and came back to Darjeeling. He converted the hotel into this cozy pub which he himself has been running since 1991. It's named after his son Joey who lives in Brighton, UK. When I asked Puran why did he name it after his son, a local sitting next to me replied "...because he misses his son a lot". I looked at Puran and he smiled in acknowledgement. As you walk in, the interior is completely wood paneled including the ceiling providing a warm and cozy feeling of a cottage. Right next to the door there is a stand that has a large collage of old magazines and news papers. A soft music plays at the background. There is only one large room in the pub. At one end of the room is the bar counter with few high bar stools. Puran himself serves drinks at the bar. On both sides of the room there are tables with cushioned chairs laid out. The wooden walls have nicely framed pictures hanging from several places. In one corner there is a TV running a sports channel. Over all the ambience is charming and simple yet having an old classy touch. Once the power went off and it was dark inside for a minute and we couldn't see anything around. I was wondering what kind of backup power they would have. The staff quickly lit up several candles, placed them on empty soda bottles and put them at different corners of the room. The candle lit room was looking magical. I heard the Swiss man sitting next to me saying "let it be like this.... we don't want the lights back". You will meet people from different walks of life here. This bustling pub is always full of foreigners. Once I met a young man Alex who came to Darjeeling from Australia. He took a break for a while and was teaching students in a school which is part of Dali Monastery. For him, Joey's Pub had become an inevitable week-end obsession. The bar is well stocked with both Indian and imported liquors including whiskey, vodka, gin, rum and other drinks. There are different types of beer and wine as well. When I once asked Puran about draft beer, he mentioned that there is a technical difficulty in stocking draft beer here. Once opened, it has to be consumed within fixed hours or otherwise it would get stale. So unless there is continuous demand, stocking draft beer is not possible. Unfortunately, there is not many takers of draft beer in Darjeeling. So this is one thing missing in this pub. There are few other things you won't get here either. There is no food served at Joey's Pub. They do offer some complimentary fried mixture (light snacks), but that's all. Another thing which Puran himself talks about is a lack of proper toilet. Yes there is one which is of Indian style and very basic, although clean. I asked Puran some of the great memories about the Pub. He wondered for a while and said there have been so many that it's difficult for him to keep a track of all. And then he went on recapturing some of them ... Joey's pub has been featured in a film of the great musician and film director Anjan Dutta who happens to be his friend. On one occasion the great singer Usha Uthup came to this pub and sang couple of songs on request. There were many other great musicians and celebrities who visited the pub over the years. He ended saying "... give it another 20 years, Joey's Pub will become a heritage pub". Puran forwarded a guest book to me which was difficult to lift due to its size and weight. It would take a full day to go through all the comments from hundreds of people who have written their great experiences in the pub. The book is a great testimony of the pub's long journey to its fame. Once I asked Puran, if there are any bad memories associated with the pub which he wants to forget. That's when I learned that this pub was once completely destroyed by fire. He went through terrible time virtually losing all his life's assets. He had to gradually rebuild it. You will still find a board in the backside saying "Under Construction". That probably explains why there is still no proper toilet in the pub. In my last visit to the pub, I asked Puran who would keep running the show after he retires. He said "Somebody will come along. It won't be my children. They won't come. They are happy where they are, neither I would want them to run this". Update May 2013: Puran has become a proud grandfather. 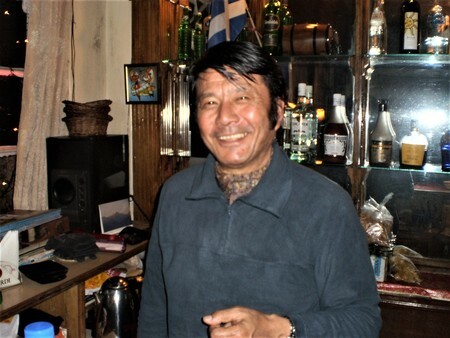 Update March 2016: Sadly, Puran Gongba, the owner of Joey's Pub and fondly known as Uncle Joey in Darjeeling, is no more. He had a massive stroke and passed away on 23rd February 2016. He was 66. Joey's Pub will no longer be the same, at least to me. But I'm sure the love and respect for Puran in the whole of Darjeeling will keep providing strength to his family and help running the show. 12noon to 10pm (can stretch to 11pm occasionally). No cards, only cash. 2 S.M. Das Road, Darjeeling. This is a lane that goes opposite to the Post Office on Laden-La road and close to the Big Bazar. Joey's Pub is only few yards into the lane and just left of the vegetarian restaurant Beni's Cafe. From the Club Side taxi stand next to Gandhi Road Police Point, it's less than 5 minutes walk. 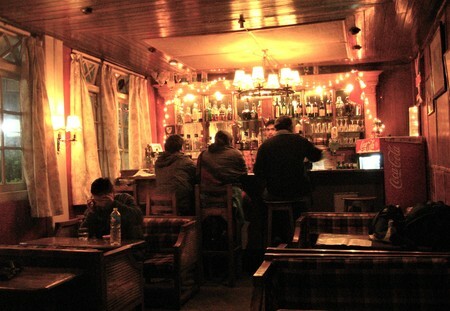 1) Visit Darjeeling Nightlife, Bars & Pubs to know all other nightlife options in Darjeeling. The best place to sit back and relax in Darjeeling after a hard day. Best music, alcohol and the man himself is truly amazing. You can let go hours listening to the music and chatting to fellow travellers. I've taken some great pictures and waiting to hand them over to the owner soon. If you have not visited yet you've missed the privilege...Love Joe's Pub!!! Sir, you are truly gifted being on this planet, you are blessed. I have never been to your pub but the information & the clips makes me feel like that I'm in Amsterdam. I'll be coming soon to your place, I'm gonna visit Darjeeling along with my buddies... Let me tell you, I was in Darjeeling for 2yrs (school time). Time passed & its a longtime I'm not getting the smell of momo's, thukpa, wywy. Anyways I'm sorry if I hurt you.. Thank you for giving me the opportunity to share something... DARJEELING, MA TIMILAI MAYA GARCHA. Hi, Revolver and Joey's Pub are close by. Should be some 10-12 minutes of walk. From Revolver, come down Gandhi Road and take a left turn into Laden La road at the police point.. Just before the Big Bazaar, take a left into the lane (SM Das Road) ... you are right there. Easy!! But if you are there too long in the pub, the walk back may seem much longer :) You can also try Seven seas (covered under hotels guide menu option), or Hotel Capital, or even Broadway. 3-4 minutes walk from these hotels. You will find the last two under Budget Hotels menu option. There are no real good budget hotels right adjacent to Joey's pub.